Valencia College will contribute $2 million to UCF’s $60 million proposed downtown campus plan. 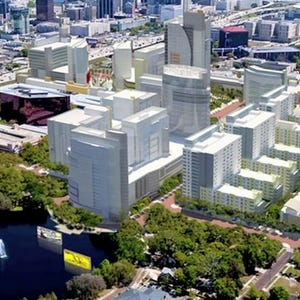 Valencia College will contribute $2 million to UCF’s $60 million proposed downtown campus plan, as stated at a Valencia Board of Trustees meeting last week. Although UCF is providing most of the funding to build the campus, Valencia's public relations director Carol Traynor said Valencia’s contribution of $2 million was calculated by factoring in the number of Valencia students who would also be using the campus. 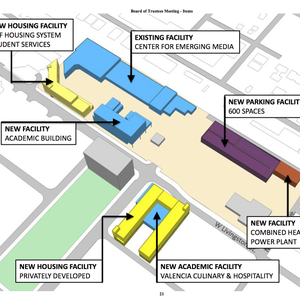 Because Valencia will use about 10 percent of the proposed new academic building downtown, $2 million is the amount proportional to the $20 million, out of the $60 million, UCF is asking for from the state legislature. Valencia also announced its plans for the downtown space, which include moving its hospitality and culinary programs. Traynor also said the school would be putting programs in place to help Parramore residents. When the campus is complete, more than 2,000 Valencia students will join their peers from UCF as part of the joint project, which Traynor said will strengthen the relationship between the two schools. Deanna Ferrante is a Senior Staff Writer and Watchdog Reporter for the Central Florida Future.